Elementica is developing a 21MW+ facility in downtown Stockholm based on the financial incentives of heat recovery in combination with an unsurpassed environmental focus. We offer various alternatives for “greenfield operation” – contact us to visit the location. Build in-house or rent Tier3 facility from Elementica. It’s your choice. When Elementica powers on it’ll provide central city heating to tens of thousands of households and source all its energy exclusively 100% carbon-free. Read on to see how you can take advantage of the Elementica offer even before it’s in operation. In addition to “regular” users of data centers we’re also looking for “special” customers; those who need a better place for their most processing-intensive tasks. There are already loads of data centers taking care of storing web pages, and Elementica is perfectly suited for those types of applications too, but the center is really designed to handle tasks that require more processing power – like online image processing, AI, game servers, captchas, research/calculation clusters, supercomputers and high frequency trading – to name a few. This is due to the fact that we recover the heat your hardware generates and sell it to the near-by city’s local heating system. 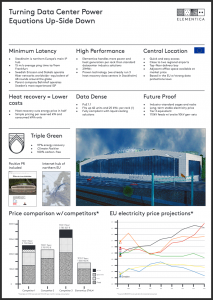 Construction time for the new harbor location in central Stockholm is about 2 years but we can offer below-market rates already today thanks to our innovative heat recovery solution in existing data centers run by our parent company Bahnhof, when you sign up for space in Elementica. In this way you can take advantage of our unique technology already today and you’ll enjoy even lower rates when we move your hardware to the new Elementica center, Triple-Green certified. This offer is limited to a certain percentage of the new facility (first come first serve). In this way we turn your equations on data center power use up-side down. We can also offer operations of customer networks, servers and applications and a highly flexible delivery process adhering to customers requirements, including operations of multi-site cloud platforms and other multi-tenant platforms. We can leverage the operational experience of running data centers, servers and networks at ISP-grade level for the last 20+ years thanks to our parent company Bahnhof. We can already today provide 200+ cabinets with distributed redundancy through our central Stockholm data centers including a future-proof promise due to the launch of Elementica. Option for relocation can be arranged and we also offer a price guarantee on energy. 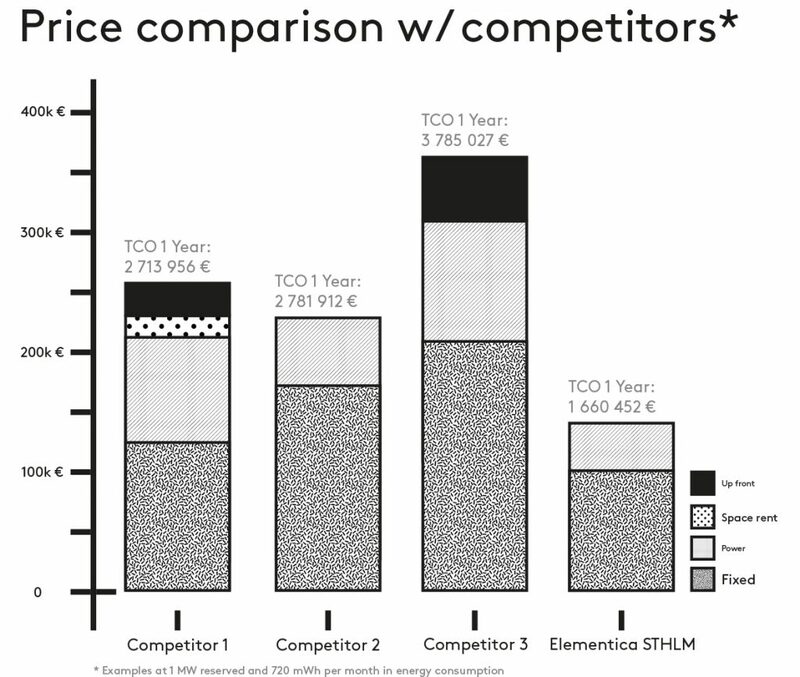 Download this two-page (PDF) Quick Facts Overview on Elementica here. Read more on how we power operations and get in touch with us today to secure your environmentally friendly, high performance and cost-effective data & computing space. Elementica, Box 7702, 103 95 Stockholm.